As readers may recall, last month BBC Radio 4 chose to feature a book titled “Where the Line is Drawn” by Raja Shehadeh in its ‘Book of the Week’ programme. Among the many issues arising in those five programmes, one factual inaccuracy stood out in particular. BBC Watch submitted a complaint on that point and has now received the following reply. If – despite BBC editorial guidelines on accuracy which state that even in factually based drama “we should ensure it does not distort the known facts” – the BBC is of the view that “[i]t wouldn’t be appropriate for us to edit it”, then the obvious conclusion is that the corporation needs to be more careful with its choice of material and that politically motivated polemics that intentionally distort facts and materially mislead BBC audiences are clearly not the best choice for Radio 4’s “[s]erialised book readings, featuring works of non-fiction, biography, autobiography, travel, diaries, essays, humour and history”. In June 2014, whilst appearing on the BBC radio 4 programme ‘Desert Island Discs’, Raja Shehadeh gave the following account of his family’s decision to leave Jaffa for their second home in Ramallah in the spring of 1948. That did not prevent Zeinab Badawi from making the following inaccurate and misleading claim in her introduction to the March 16th 2015 edition of ‘Hardtalk’ shown on the BBC World News channel. The same claim appears in the programme’s synopsis on the BBC website. 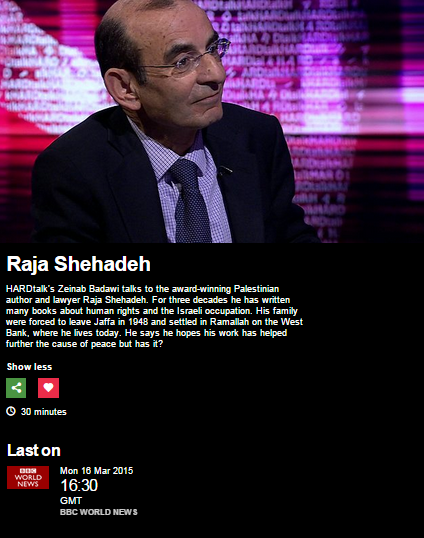 Notably, Badawi makes no attempt to inform her audience of Shehadeh’s activities beyond “author and lawyer”: no mention is made of his record of political activism with organisations such as Al Haq and Palfest, meaning that viewers – in clear breach of BBC editorial guidelines on impartiality – are denied the ability to put his comments into their appropriate context. Predictably, Shehadeh uses the platform provided by the BBC to promote the well-worn language and distortions of anti-Israel campaigning. No less predictably, little effort is made by Badawi to counter that propaganda. Audiences hear mostly unchallenged references to Israelis as ‘colonisers’, promotion of the ‘apartheid’ trope and comparison to South Africa, the claim that “Israel never left Gaza” along with description of the Gaza Strip as a ‘large prison’ and the claim that the Arab-Israeli conflict is “the most important issue in the world today” and “at the core of the problems of the Middle East”. Shehadeh distorts history both actively and by omission with viewers hearing, for example, an account of his father’s post-1967 proposals which is devoid of any mention of the Khartoum Declaration and a euphemistic representation of the 2013/14 round of negotiations which eliminates the Palestinian Authority’s decision to run those talks aground by means of its reconciliation deal with Hamas. And so here we have yet another example of the role played by the BBC in mainstreaming anti-Israel delegitimisation and defamation by means of a passive-aggressive failure to challenge the falsehoods and factual distortions promoted by an inadequately introduced political activist. 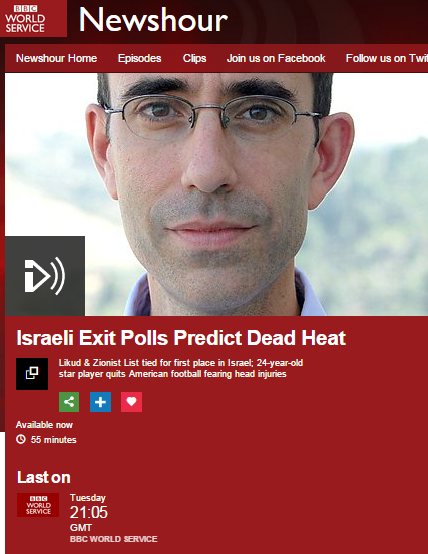 The BBC World Service radio programme ‘Newshour’ devoted part of its March 17th afternoon edition to the subject of the elections being held in Israel on that day. In the first part of the programme (from 00:45 here) listeners heard from Tim Franks talking briefly to voters at a polling station in the Kiryat Yovel neighbourhood in Jerusalem before conducting interviews with Yitzhak Herzog and Likud campaign manager Aron Shaviv. Knell’s report was in fact just a version of her filmed report from Ramallah which had been slightly modified for radio and it included the same inaccurate claim about the voting rights of some Jerusalem residents and the same misleading propaganda from Fatah’s Husam Zomlot. But that obviously did not satisfy the BBC’s urge to make this story about something it was not and so Iqbal then conducted a lengthy interview with Raja Shehadeh whom she described merely as an “award-winning Palestinian writer and human rights lawyer”, without making the required effort to inform listeners of Shehadeh’s political activities which are obviously very relevant if audiences are to be able to put his contribution into its correct context. Predictably – and with more than a little help from Razia Iqbal – Shehadeh painted a picture in which Palestinians were portrayed solely as passive victims. Iqbal made no attempt to remind listeners that, for example, the Palestinian Authority initiated the second Intifada during the office of a Labour government headed by Ehud Barak and following the Camp David talks. In addition to failing to challenge the chimera of “Israel has moved to the right”, Iqbal also refrained from questioning Shehadeh with regard to the results of the 2005 removal of all Israeli villages from the Gaza Strip and some in Samaria – a move which clearly did not prompt the Palestinians to make any “move forward in the peace process”. 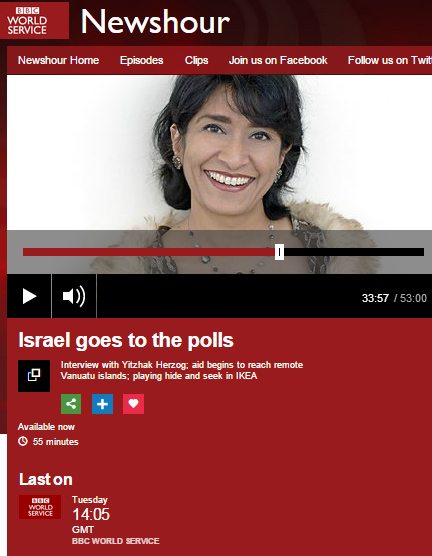 In other words, the entire five-minute interview with Shehadeh was – like Knell’s interview with Husam Zomlot – no more than opportunistic use of the Israeli election to promote political propaganda which steers BBC audiences towards an inaccurate view not only of the election itself, but of the wider issue of the Palestinian Israeli conflict. The evening edition of ‘Newshour’ on March 17th (from 00:30 here) also featured contributions from Tim Franks in Jerusalem focused around the topic of the exit polls which had just been announced. Listeners heard from Kevin Connolly and Yolande Knell at the Likud and Zionist Union HQs respectively as well as short interviews by Mark Lowen with two Israeli voters in a Tel Aviv pub. Franks was joined by Israeli journalist Emmanuel Rosen but, despite the opportunity that presented to finally inform listeners about the background to the main issues of the election, Franks yet again (as we have already seen in much of the BBC’s other coverage) brought the focus back to the topic the election was not about. Later on in the programme (from 26:30) Franks interviewed candidates from the Labour and Likud parties. Like Emmanuel Rosen before him, Nachman Shai noted the “deciding power” of Moshe Kahlon and his Kulanu party in the formation of any coalition, but Franks again passed up on the chance to finally provide BBC audiences with some background to that new party, despite the fact that the BBC had barely covered the topic. Notably, Franks cut off Sharon Haskell as she spoke about a factor which had important influence on the election results: the intervention of foreign funded interest groups. Hence, BBC audiences did not get to form any understanding of how the final results of the election were affected by that factor. From 33:20, Franks once again took the focus away from the issues upon which the election was fought. In other words, members of the BBC’s audience who perhaps thought they would gain some insight into what this election was all about, what worries Israelis and the complex political system in Israel had no chance of their expectations being fulfilled because the BBC decided long ago that the story itself would not set the agenda. Instead, it chose to devote its coverage to the issue upon which it thinks audiences should be focusing. The result of that is that more airtime was given to ‘views from Ramallah’ than to informing audiences about the views of the people who actually determined the result of the election in places where the BBC rarely treads such as Kiryat Shmona, Shlomi, Sderot and Arad. Remarkably – as readers have no doubt already noticed for themselves – despite the plethora of Palestinian interviewees seen and heard in BBC coverage of the Israeli election, at no point did any BBC journalist raise the topic of the absence of democratic elections in the PA controlled areas during the last decade and how that factor – and the underlying reasons for it – might be having an effect on the peace process. 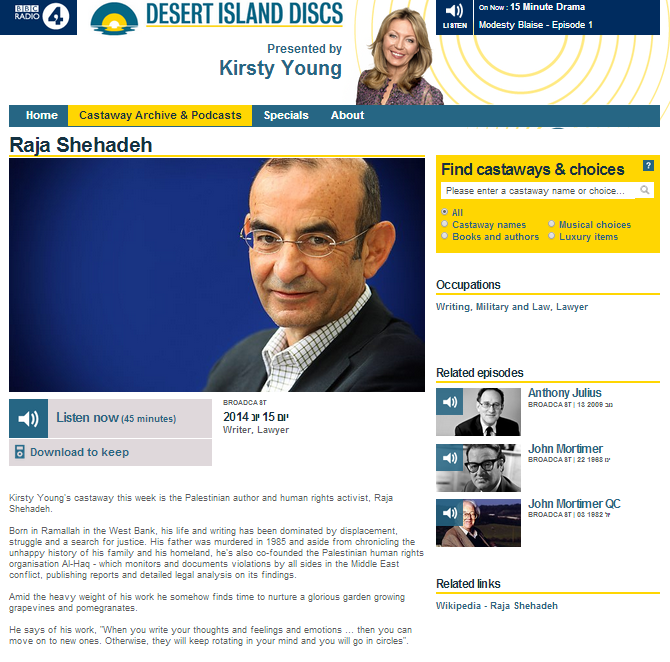 The June 15th edition of BBC Radio 4’s ‘Desert Island Discs’, presented by Kirsty Young, featured Raja Shehadeh in the guest seat. The programme can be heard here. Perhaps the most remarkable feature of the programme is its across the board erasure of Palestinian and Arab violence over the decades, but other parts of the context-free political narrative it promotes and amplifies are also notable. A quick look at the map is sufficient to be able to appreciate the lack of accuracy in Shehadeh’s statement – or perhaps his misunderstanding of the word ‘literally’. Under the terms of the Oslo Accords Ramallah – which is of course in Area A – was passed over to full Palestinian Authority control in 1995. 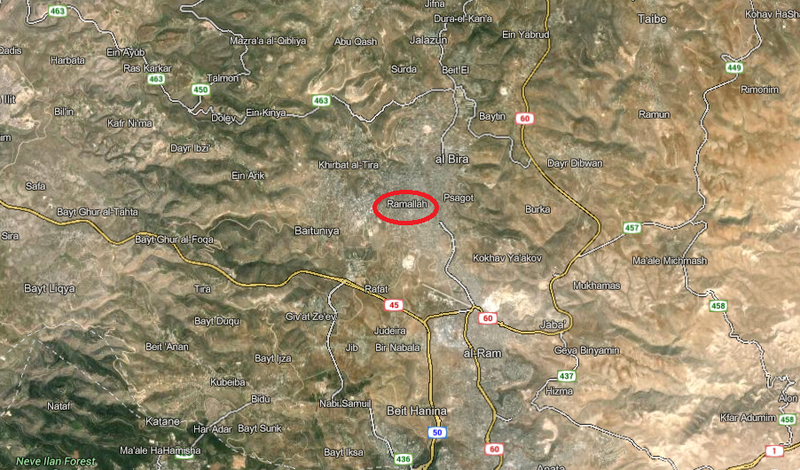 In other words, Shehadeh has lived under Palestinian rule – rather than ‘occupation’ – for nineteen years already. Conveniently, Mr Shehadeh neglects to mention that at the time of his childhood trips to the Dead Sea it, along with the rest of the area, was under a Jordanian occupation unrecognized by the international community. His host of course refrains from clarifying that point to listeners too. Later on, Shehadeh opts for the ‘Israel denial’ option. Shehadeh goes on to complain that Israeli counter-terrorism and security measures (made necessary of course by the terrorism neither he nor his host mention throughout) disturb his country walks. Later, Shehadeh gives his version of the story of his family’s decision to leave Jaffa for their second home in Ramallah. The declaration of the State of Israel a couple of weeks after the Shehadeh family decided to travel to their summer home in Ramallah of course had nothing whatsoever to do with the “displacement” of those who decided to leave their homes. Young’s subsequent cameo of the Six Day War is no more accurate. No context is given regarding the attack on Israel by surrounding Arab states and particularly Jordan’s decision to enter that war despite the Israeli request not to do so. Shehadeh then goes on to describe his father’s post-war plan for what he describes as a “two state solution”. No mention is made of the Arab League’s Khartoum Declaration in response to Israeli offers of peace immediately after the war. Shehadeh later whitewashes terrorism by implying incorrectly that it began after – and because of – the war in 1967 (the PLO was of course formed three years before any ‘occupation’ existed). Two further instances of whitewashing of Palestinian violence come towards the end of the programme. The missing context is of course the PA-initiated second Intifada and specifically the Park Hotel massacre which led to Operation Defensive Shield. Again – the context of Palestinian violence and the first Intifada is erased from the picture. Whether or not Kirsty Young and her producers actually intended this programme to be an exercise in the Sunday morning promotion and amplification of Raja Shehadeh’s well-worn context-free politically motivated narrative, it certainly turned out that way. So much for editorial standards on accuracy and impartiality.